Today is indeed a special day for Sonam Kapoor and Anil Kapoor! The father-daughter duo’s first film together Ek Ladki Ko Dekha Toh Aisa Laga hit screens today and the 62-year-old actor shared a heart-warming message for his actress daughter. “Never have I been so proud of you Sonam Kapoor. It has been my honour sharing the screen with you beta,” he wrote for Sonam and addressed the audience to say: “Today we hand over our labour of love Ek Ladki Ko Dekha Toh Aisa Laga over to you… our audience.” Even in the film, Anil Kapoor plays Sonam’s father. 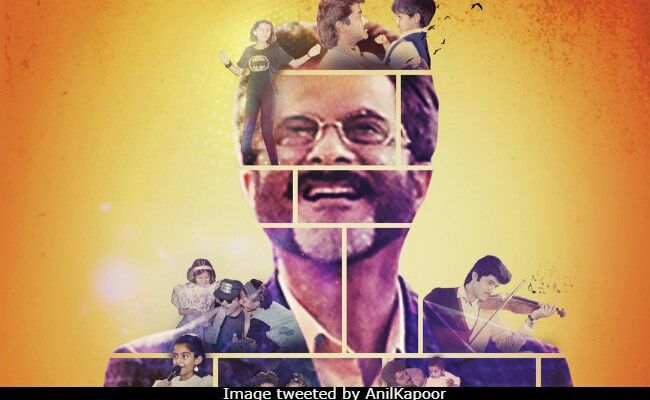 To accompany his message for Sonam, Anil Kapoor did the sweetest thing ever. He made a created a poster of sorts with one of his stills from Ek Ladki Ko Dekha Hai and juxtaposed throwback photos of Sonam. In most of them, Sonam features with her dad from when she was much younger. And just to add a personal touch to the photo, Anil Kapoor added a photo of himself from 1942: A Love Story. Ek Ladki Ko Dekha Hai gets its title from the 1994 film, in which he famously co-starred with Juhi Chawla, who also stars in Ek Ladki Ko Dekha Hai. In a recent interaction with news agency PTI, Anil Kapoor shared his experience of working with his daughter for the first time and wrote: “Sonam teaches me everything. She is so brilliant, honest, full of love, generosity, grace, dignity, intelligence. So I keep taking these things from her. Meanwhile, Ek Ladki Ko Dekha Toh Aisa Laga has already earned positive reviews from celebrities such as Akshay Kumar, with whom Sonam starred in PadMan, Sonam’s good friend designer Masaba Gupta, Akshay’s wife Twinkle Khanna, Karan Johar and others. Ek Ladki Ko Dekha Toh Aisa Laga also stars Rajkummar Rao and promises and unconventional love story. Ek Ladki Ko Dekha Toh Aisa Laga is a film directed by Shelly Chopra Dhar.